These are the rabbits who will be bred over and over (Oz Farms, one of the growers who will be supplying Whole Foods in Northern California, brags that “one rabbit can produce up to 320 pounds of meat in a year in just a small area” – Press Democrat, June 20, 2014) until they are spent, while their babies (called “fryers”) are slaughtered, with no protection from the Humane Methods of Slaughter Act, screaming in pain. 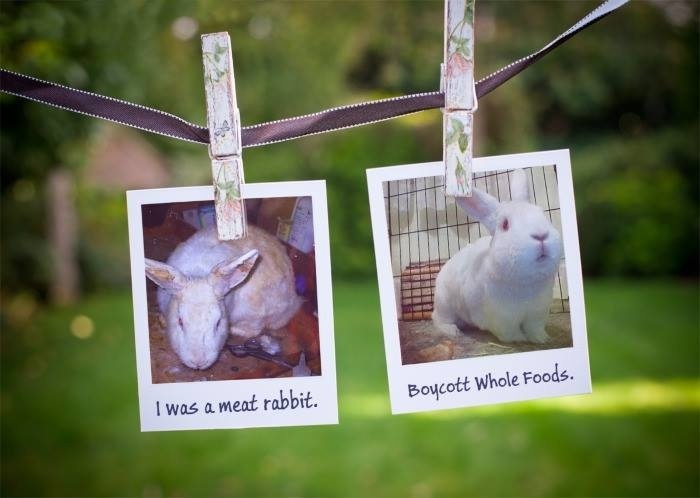 (There are two preferred methods of killing rabbits before their throats are slit–one involves smashing them on the head with a blunt object like an iron bar, and the second involves pulling on their body while snapping their head back, breaking their neck. Neither are foolproof, nor are they painless. They are slaughtered at 9-12 weeks, when they reach 5 pounds, or 2.5 pounds “dressed,” which means butchered.) Oz makes $7.99 for each of the rabbits that they raise, kill and sell (Press Democrat, Jan. 2, 2014).